Despite their close proximity, Presidents Day and Valentine's Day seemingly have nothing in common. One often warrants a day off from work, while the other most often casts a divisive onslaught of emotions for those who either love or hate the day. And yet, much to our surprise, Target has done the unimaginable and combined the two into a design enthusiast's biggest holiday yet: The Love & Liberty Event. Aptly named after the two holidays that inspired it, the Love & Liberty sale features up to 25 percent off home items online only. That means you can shop your favorite brands, from Safavieh to Magnolia, from the comfort of your own couch (and without fear of the inevitable shopping haul that stepping foot into a Target pretty much guarantees). 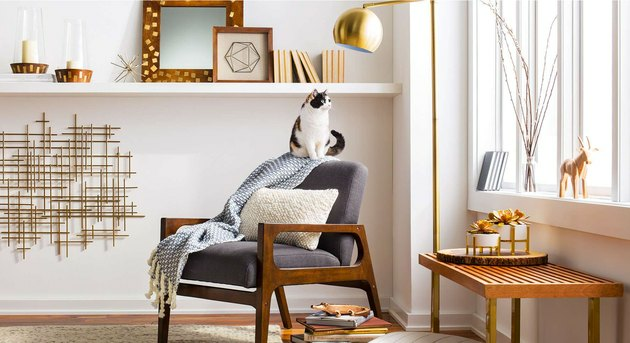 But what's more, Target is offering an extra 15 percent off curtains, indoor and outdoor rugs, and furniture with the promo code HOME, taking many purchases to a whopping 40 percent off. Want to snag a vintage area rug for almost half off? This indigo one is amazing. Been meaning to set up your home office? Start with a sleek desk for less than $100. Pretty much everything your home is missing is majorly discounted, so what are you waiting for? Shop the sale now (and remember to thank President Washington and St. Valentine while you do).